Imagine a future in which solar cells are everywhere around you—on your window shades, in your laptop cover, in your clothing, perhaps even on a folded slip of paper that you carry in your pocket and take out when you want to charge your cell phone or other electronic gadget. That’s the future that several MIT researchers envision. 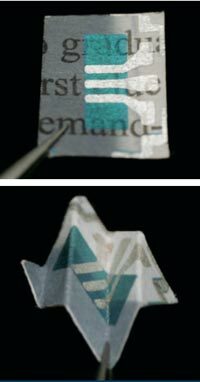 Using a novel process involving moderate temperatures and no liquids, they’ve printed photovoltaic (PV) cells on tissue paper, printer paper, newsprint, textiles, and even plastic food wrap. They’ve made solar devices that are low-cost, lightweight, flexible, and durable—features that make them ideal not only for integrating into consumer products but also for shipping to remote regions of the world where energy demand is growing rapidly and there’s no power grid in sight. For PVs to make a real difference to our energy future, they need to pervade people’s lives worldwide. But today’s PVs are typically fragile and must be moved with care and installed by trained experts to avoid damage. More robust PVs have been made on flexible materials such as plastic, but thus far they have not been entirely successful. Problems have stemmed largely from the anode (the positive electrode), which has a tendency to crack or lift off when the surface it’s mounted on is bent. If PVs are to be manufactured and used on a large commercial scale, they must be made on lightweight, flexible materials with anodes that adhere under the most extreme stress—and that are composed of common, inexpensive substances. Anodes with those features have now been fabricated by Karen K. Gleason, the Alexander and I. Michael Kasser Professor of Chemical Engineering, and her colleague Vladimir Bulovic, professor of electrical engineering, with their “Paper PV Team”: graduate students Miles C. Barr, Jill A. Rowehl, Jingjing Xu, and Annie Wang; postdoctoral associate Richard R. Lunt; and undergraduate Christopher M. Boyce. The work takes place in the Eni-MIT Solar Frontiers Center, which is co-directed by Bulovic, and funded by the Italian oil and gas company Eni S.p.A.
Key to their success is a process called oxidative chemical vapor deposition, or oCVD. Invented by Gleason, oCVD is designed especially for making thin films of organic polymers—carbon-containing molecules that are composed of repeating structural units and offer desirable traits including low cost, good electrical conductivity, and good mechanical properties that allow them to be flexed, stretched, and even folded. The oCVD process is based on conventional CVD, a well-known method of depositing a thin coating of one material on the surface of another (the “substrate”). It involves heating up reactant gases and the substrate in a furnace until the former react and deposit on the latter. But the temperatures and other operating conditions required for CVD are too harsh to use with the organic materials of interest to Gleason. Adding the oxidant and carefully selecting the correct starting materials enable oCVD to operate at “gentler” conditions inside a vacuum chamber. In addition, the oCVD process is completely dry—no liquids allowed. It therefore provides a new capability for making polymers. “Thousands of people synthesize polymers in solution,” says Gleason. “We don’t really want to compete with them. Instead, we want to do things they can’t do”—including making robust anodes out of polymers composed entirely of earth-abundant elements such as carbon, hydrogen, oxygen, and sulfur. To make their anodes using oCVD, Gleason and her research group start with two reactants: iron chloride, the oxidizing agent, and ethylenedioxythiophene (EDOT), the monomer. The EDOT molecules are the basic building blocks that link together to form long chains of the polymer known as PEDOT. The researchers first prepare the selected substrate by placing on it a physical mask that can be pulled off to leave the desired pattern. (Think of using stencils to paint a strip of flowers on the wall of a room.) They then spray their two reactants, both in vapor form, onto the surface of the substrate. Three things happen at once. When the iron chloride and EDOT meet on the surface, they react to form PEDOT. At the same time, they form a thin film. And because of the presence of the mask, the film is deposited in the pattern needed to act as an anode. A test of how flexing affects the conductivity of two sample electrodes. One electrode was made by MIT researchers using oxidative chemical vapor deposition (oCVD) of a polymer known as PEDOT. The other is a commercially produced electrode made of indium tin oxide (ITO). The conductivity of the conventional ITO electrode starts out somewhat higher than that of the oCVD electrode, but within the first few flexing cycles it drops dramatically. In contrast, the oCVD electrode displays essentially no loss in conductivity from the first to the 1,000th flexing cycle. The remarkable features of the vapor-printed anodes—including their flexibility and robustness—can be traced to details of the oCVD process. Most notably, oCVD produces an unusually tight adherence between the deposited material and the substrate. The images show the results of using three methods of depositing thin films on fiber mat. The first image shows the uncoated mat, with its complex fiber structure. The coating in the second image, created using a liquid-based process, is irregular, with blobs in some areas and no coverage in others. The one in the third image, made with an evaporation process, covers the surface such that individual fibers are no longer distinguishable. The final image shows the outcome using oCVD: a thin film that conforms to the surface so that the individual fibers of the mat are still clearly visible. “With oCVD, the deposited material follows the geometry of the substrate,” says Gleason. 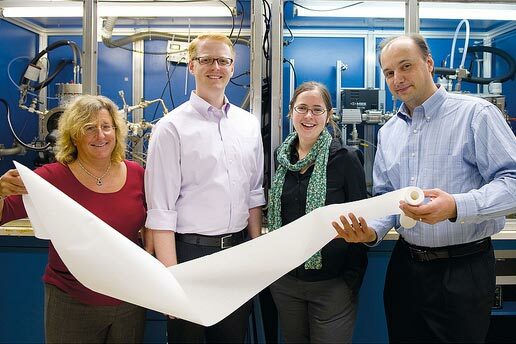 “It’s like shrink-wrapping each individual fiber.” Thus, with oCVD, an anode can be created on virtually any substrate—even the most fragile paper—without degrading its structure, creating defects, or altering its flexibility or other characteristics. Better still, the deposited film is integrally linked to the surface of the substrate. In oCVD, the oxidant “activates” the surface, creating reactive sites where the monomers can attach—just as they attach to one another during growth of the polymer chains. The polymer chains are therefore “grafted” to the surface, a bit like hairs growing up out of their roots. In contrast, polymer chains that are not grafted lie in a loose jumble on the substrate. To demonstrate the strength of the adhesion, the researchers performed “torture tests” of samples with grafted and ungrafted coatings. In one test, they immersed the coated samples in an ultrasound bath—an aggressive environment similar to boiling water. After two hours, the grafted coating was still attached, while the ungrafted one had let go. In another test, they used a stencil to create a pattern on two samples. When they lifted the stencil off the grafted sample, the pattern remained intact, with distinct edges. In contrast, with the ungrafted sample, large sections of the coating lifted off with the stencil so that no discernible pattern remained. Even more telling were experiments focusing on flexibility and performance. These tests involved two samples: one a PEDOT electrode prepared using oCVD and the other a commercially produced indium tin oxide (ITO) electrode, both deposited on PET (a thinned-down version of the plastic used in soda bottles). The figure on page 8 shows conductivity measured in the two electrodes as they underwent 1,000 flexing “cycles.” The results are striking. 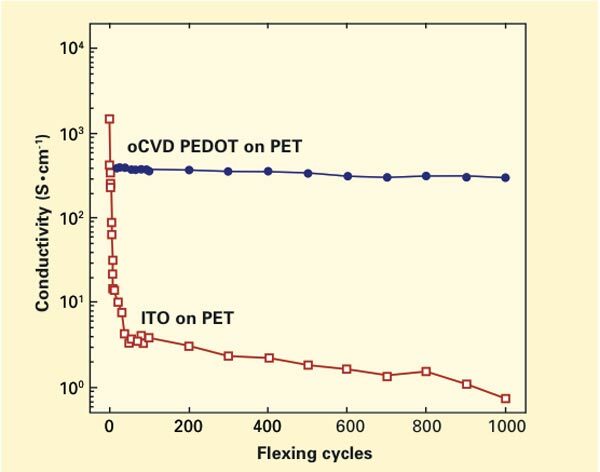 The conductivity of the conventional ITO electrode starts out somewhat higher than that of the oCVD electrode, but within the first few flexing cycles, it drops dramatically. In contrast, the oCVD electrode displays essentially no loss in conductivity from the first to the 1,000th flexing cycle. These photos show single PV cells deposited on newsprint (top) and on copy paper (bottom). The dark gray area is the anode; blue is the photoactive layer; and silver is the cathode coming from the other side. In the left sample, the text of the newspaper is still visible—undisturbed by the dry deposition of the PV materials. The right sample is folded, but it still functions. A working PV cell, of course, requires more than just an anode. Deposition of the remaining components takes place in Bulovic’s lab. He and his team use evaporation, another dry process but with no chemical reactions involved. They take a material in solid form, heat it until it becomes a gas, and then allow it to condense on the surface of interest. Using that approach, they coat the PEDOT anode with several “photoactive” nanostructured thin films—the layers that absorb light and cause electrons to flow—and then finally the cathode (the negative electrode). The result is a complete PV cell. The photos on this page show single cells printed on newsprint and copy paper. A single PV cell is unlikely to be useful in practice, so the researchers have made PV arrays, using the procedure shown below to lay down many interconnected cells simultaneously. One sample array, shown on page 10, contains 250 PV cells on a 7 cm by 7 cm piece of paper. In ambient light, this array can generate 50 volts and microamps of current, which is much more than enough to power the LCD clock display in the photo. An equivalent array on smooth glass could produce 67 volts—but would get catastrophically damaged if it were flexed and folded, as the array on paper has been. In fact, the sample shown was made in September 2010, and it’s still running. Even when the researchers encapsulated it within a 1-micron-thick polymer coating and submerged it in water, it continued to produce power. These diagrams show how the researchers create an array of interconnected PV cells. Using their masking technique, they first lay down the anodes; next come the active layers at a 90-degree angle; and finally the silver cathodes—a little offset from the anodes so as to connect each cell to the one next to it. Little L’s connect the end of one row to the beginning of the next. Thus far, the new PV devices have a light-to-electricity conversion efficiency of only about 1%. But the researchers are working on another PV device composition that they think will push that number up to 4%. Also, they point out that—even at 1% efficiency—their PV arrays on paper can power small electronic devices. And they emphasize that costs could be low. For example, paper is 1,000 times less expensive than traditional glass substrates for the same area and about 100 times less than common plastic substrates. Those numbers become even more impressive when considering that the substrate represents 25%-60% of total material costs in current solar modules. The ease with which the new PVs can be transported and installed will mean further cost savings and—perhaps more importantly—the possibility of unprecedented dispersion of electric power generation worldwide. Indeed, if all goes as planned, the researchers envision their lightweight PV devices being folded or rolled up and trucked long distances over rough terrain to remote villages. Whether tacked onto roofs, taped on windows, or built into clothing, these devices could serve as the first local source of power to millions of people who have cell phones but no convenient way to charge them. The prototype array shown here contains 250 PV cells on a 7 cm by 7 cm piece of paper laminated in plastic. 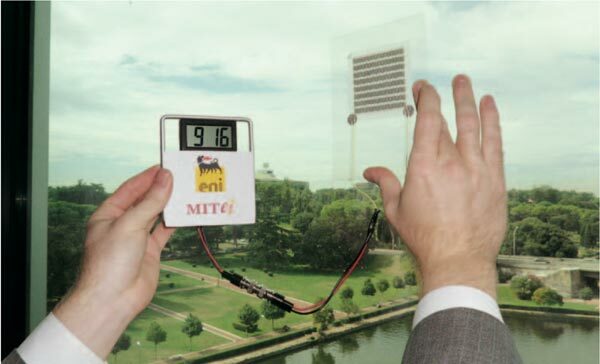 In natural light on a cloudy day, it generates 50 volts—enough to power the LCD clock display in the photo.